Shopping for guys is hard… Especially if they already have everything! We’re here to help with our favorite personalized gifts for all the men in your life - dad, son, husband, groom or groomsmen! Read on for our top gift picks perfect for Father’s Day, his birthday, or the holiday season! Finding the perfect gift for your dad or groomsmen can be tough. Lucky for you, we have the perfect personalized options to thank them for being apart of your special day! Our Monogrammed Men’s Handkerchief is the perfect gift for the father of the bride - he can keep it close by to dry his happy tears. Add a classy touch for the fashion-forward groomsmen by adding our Monogrammed Cuff Links to their outfits. Or gift our Personalized Leather Wrapped Flask for the guys who need a little liquid courage. Know a guy who just loves to entertain? We have the perfect personalized gift options for him! Our Personalized Decanter Set is the perfect gift for the guy who likes to serve his guests in style - comes with a glass bottle wrapped in leather and 4 glasses. Golf guru’s will love our Personalized Caddy Cheese Board; it’s the perfect gift for the cheese and wine lover! Or gift our classic Personalized Leather Coaster Set for the easy-going entertainer. Is that special guy in your life a huge sports fan? Is his favorite weekend activity tailgating for the big game? 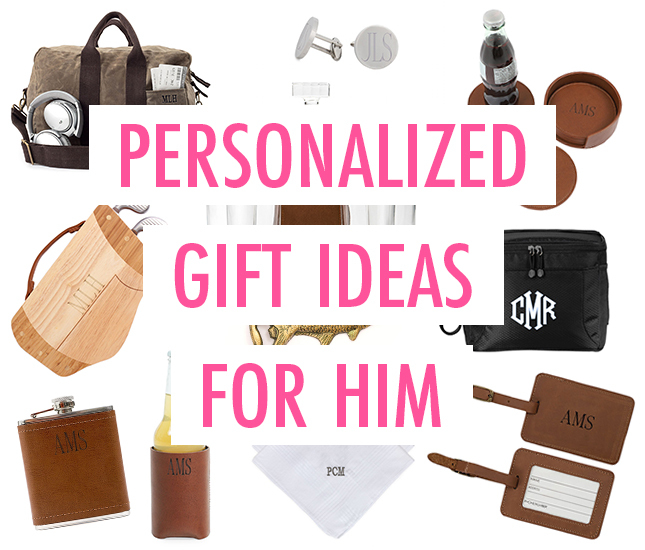 Then we have the perfect personalized gifts for him! Our Monogrammed Leather Koolie is the perfect tailgate accessory - made of genuine leather, this koolie has an attached bottle opener in a pocket on the back. Serious tailgate enthusiasts will definitely appreciate our Monogrammed 12 Can Cooler; it’s the perfect cooler bag to carry as he hops from tailgate to tailgate. Or keep it simple with our Trout Bottle Opener, perfect for the guy who is always looking for a bottle opener. Trying to find the perfect gift for the guy who’s never home can be hard, but we have the perfect gifts for the guy always on the go! Our Personalized Waxed Canvas Carry-On Duffel is the perfect gift for any traveler - featuring durable materials and tons of storage space. If he already has his go-to duffel bag, then our Personalized Waxed Canvas Dopp Kit is the next best option; it’s perfect for keeping all of his toiletries organized while traveling. Or gift our Personalized Luggage Tag for the traveler who already has it all. So there ya have it! All of these gift ideas are perfect for birthdays, housewarmings or any celebration occasion! What are your favorite personalized products? Let us know in the comments below!